I’m currently reading the intriguing “The World Until Yesterday” by Jared Diamond, some of which compares the attitudes toward, and treatment of older people in Western societies to that of ‘traditional’ (think tribal) societies. Diamond makes reference to the role that older people play in advertising in western, or westernised societies – their appearance in advertising typically reserved for medicine and supplements, ‘mobility aides’ (Stannah chairlifts, perhaps), or maybe to fulfill the role of Grandparent to a cute child. They are rarely seen promoting products that we might all consume – off the top of my head – pizza, mobile phones, chocolate, toilet paper, rum, coffee, cars…. What does this tell us about our attitudes toward people over, let’s say, 65? Another fascinating insight into this subject came when watching a clip from Britain’s Got Talent. I’m including the clip, in case you haven’t seen it, because it seems to have the effect of filling people with a sense of joy. Now, I’m as cynical as the next hardened cynic when it comes to these shows – I think it’s pretty obvious that the ‘judges’ have been primed for what’s coming, and things are choreographed, down to Simon Cowell looking bored and buzzing early. So what is there to enjoy? Again, it seems to me that most of, if not the entire audience have an extraordinary emotional response that looks to me like unbridled joy. Then there’s Paddy herself, who is evidently not only a powerful personality but also physically remarkable – strong, agile, mobile, quick, and with impressive coordination. And yet, I’m left with a question – a niggling thought. Why is she exceptional? Why does the sight of this elderly woman demonstrating strength, skill, agility, and coordination get us so excited. Obviously the answer is that she IS very unusual (but as the videos below illustrate, she is far from alone). So the question should really be, why SHOULD she be exceptional? How is it that we have been conditioned to believe – to know, even – that old people are inherently decrepit? And when does that built-in physical obsolescence start to take effect – sixty? Or seventy? I have clients in their early sixties who are convinced, indeed resigned to the notion that they are now too old to do certain things; and that their age means that they have to accept that their body necessarily fails them. In ‘The World Until Yesterday’ the author makes reference to tribes that traditionally killed old people, or left them to fend for themselves (amounting to the same thing). Until the 1950s the Kaulong people of New Guinea practiced the ritualised strangling of widows – when her husband died the widow would call upon family members to strangle her! (While there’s obviously one to be had, I’m not going to get into a discussion of misogyny here). Other tribal societies have traditionally revered their older members for their wisdom; for having the most refined skills; or as care-givers for the youngest in the tribe. Western society’s attitude toward its older population falls somewhere between the extremes. Happily, there’s no ritualised killing, but there’s not necessarily much reverence either. How much of that is because, as younger people we have been conditioned to expect little from old age (the very phrase ‘old age’ appears to be inappropriate in this context – a symptom of the problem). When we reach 60, or 70, or whatever it might be, we know what to expect. And yet, Paddy apparently didn’t receive that kind of conditioning, or was able to shrug it off. As a Pilates teacher, I have one of the best role models to follow in terms of expectations for older age. 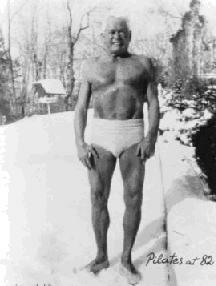 It would seem that Joseph Pilates did his best work form the age of 50 onwards, and remained strong and vigorous until his death. I cannot find a clip to include here but the “Romana’s Pilates Ultimate Mat Challenge” DVD includes footage of Romana Kryzanowska, aged 82 (I think) doing the hanging on the Cadillac and describing it as her “daily loosener up-er”. We know what’s possible – as a profession we have excellent examples – and yet, how many of us (Pilates teachers) have been trained to think that the Roll Up, or the Roll Over are contraindicated for ‘the elderly’? I’m not advocating a lack of care or caution, but wondering if we have an instinct to set the bar too low (Yes, I’ve been here before). I know that for someone with osteoporosis, to collapse in their spine as they go into the Roll Up, or Roll Over, could be dangerous, but we wouldn’t teach anyone to collapse in their spine in a Roll Up, would we? Because that’s not what Pilates is about. So whilst it may not be the best idea to introduce that exercise to an older person in their first session, or even in their tenth session, isn’t their the possibility that, in time, the eccentric control that this exercise requires could be just the kind of stress on their bones that will make them stronger. Here are some more links/video clips of people ‘who should know better’ being physical. If we share enough of these perhaps we can begin to reshape prevailing notions of what growing old means…. ‘The Hip-Operation Crew’ from New Zealand – the oldest hip hop dance crew in the world. 4 responses to How will you age? Stop labelling and asking fit older people their age. We are ageless! Get it!! Great article Mike – I love the Hip-Operation crew from NZ – how cool! Thanks Doris, that’s really good to hear.